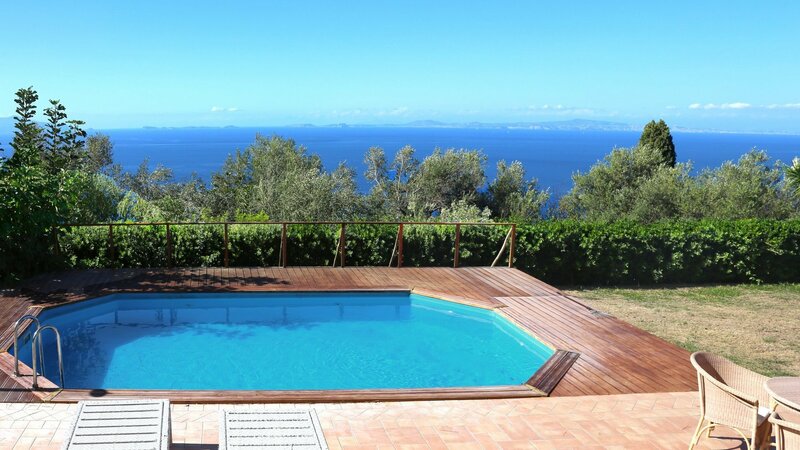 Neroli is a luxury holiday house specifically thought for families and friends who are willing to spend a relaxing holiday in a quite area of the island with all modern comfort, while still being close to Anacapri and its liveliness, with shops, restaurants and night clubs. 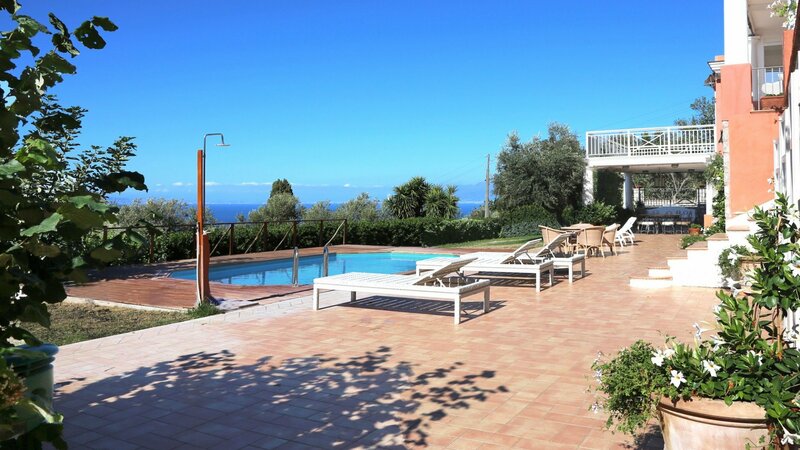 The villa is situated along a narrow and quiet road, just 10 minutes from the city center. 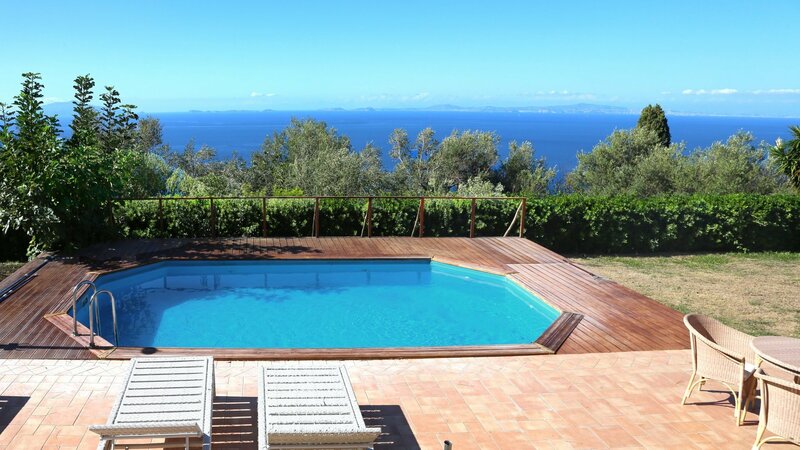 It is immersed in the lush Mediterranean scrub, with many flowers and olive trees, and offers priceless views over the sea and the Naples bay. 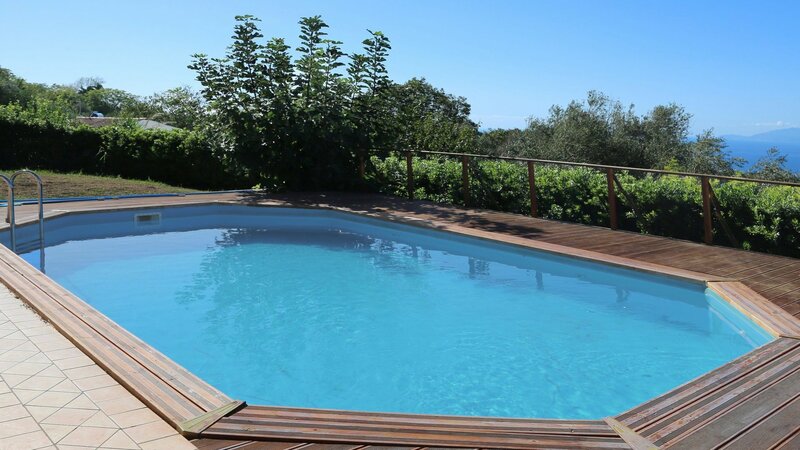 The outdoor swimming pool surrounded by a sun deck with sun beds and chairs is the ideal place for enjoying a relaxing vacation. On the ground floor, there is a fully equipped kitchen and four bedrooms, all en suite, luxuriously furnished and with direct access to the pool area. A large external staircase leads to the first floor, where is a wonderful outdoor terrace equipped with lounges, tables and chaise long, just perfect for spending time in complete relaxation admiring the ocean. 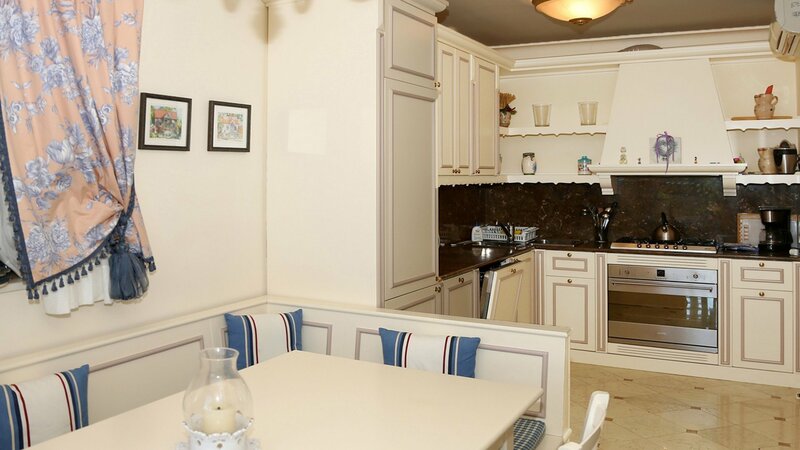 On the same floor, there is a spacious living and dining room embellished with marble floors and antique furniture. 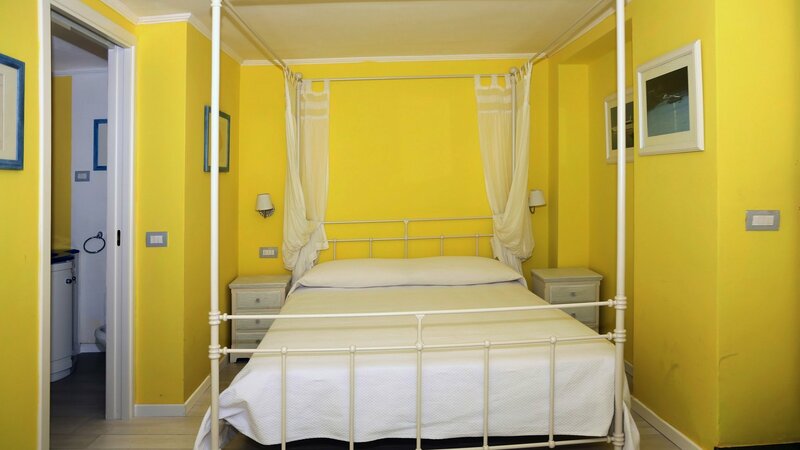 A separate guest bedroom – situated on the ground floor, opposite to the parking space – can be used by large groups of 10 people. 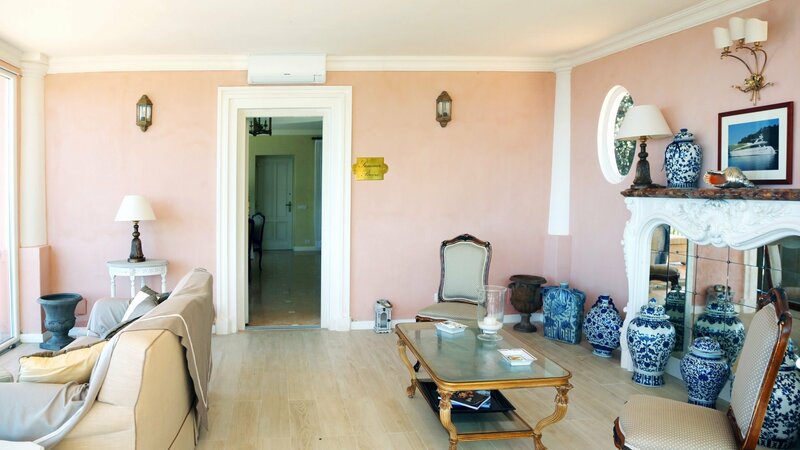 The decor, very elegant and refined, reflects the style of the villa owners, who took care of every single detail and equipped their villa with all the ultimate comforts to guarantee their guests a pleasant stay in the island of Capri. living area with big windows offering sea view and access to covered outdoor area, dining area with TV and access to balcony with sea view. approx. 17 steps down; kitchen with TV, dining table for 6/7 people and access to outdoor covered dining area and swimming pool. 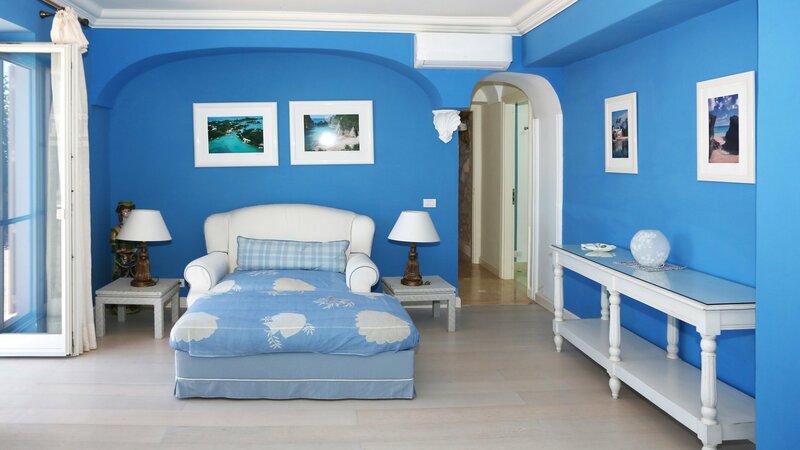 bedroom 1: double bedroom (not convertible into a twin) with sea view, safe, TV, access to pool area and en suite bathroom with hydro massage bath tub (+ extra hand held shower) and double washbasin. 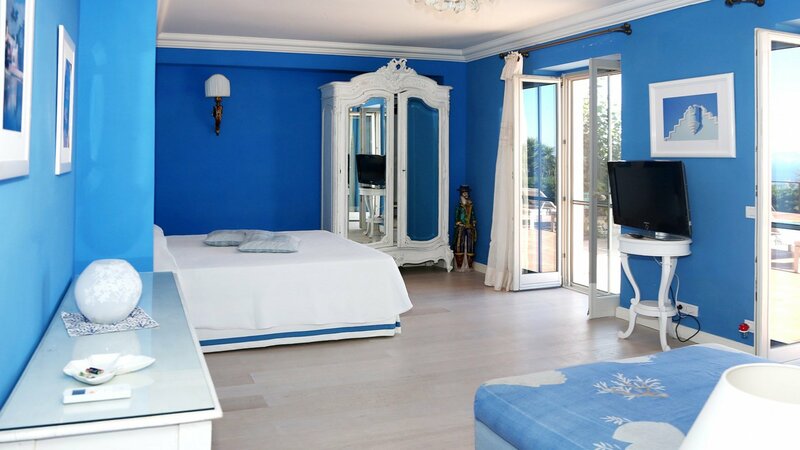 bedroom 2: double bedroom (convertible into a twin) with sea view, TV, access to outdoor pool area and en suite bathroom with hydro massage bath tub (+ extra hand held shower). bedroom 3: double bedroom (not convertible into a twin) with sea view, TV, access to outdoor pool area and en suite bathroom with shower (+ extra hand held shower). bedroom 4: master bedroom (not convertible into a twin) with small living area, TV, access to outdoor pool area and en suite bathroom with shower ( extra hand held shower). bedroom 5: double bedroom (not convertible into a twin) with TV, A/C, sea view and en suite bathroom with double washbasin and shower (curtain, hand held shower only). 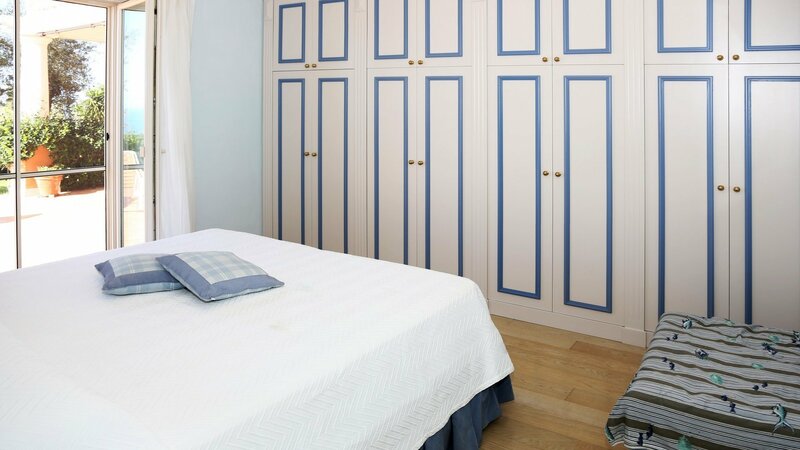 This bedroom has a lower standard regarding the other bedrooms. 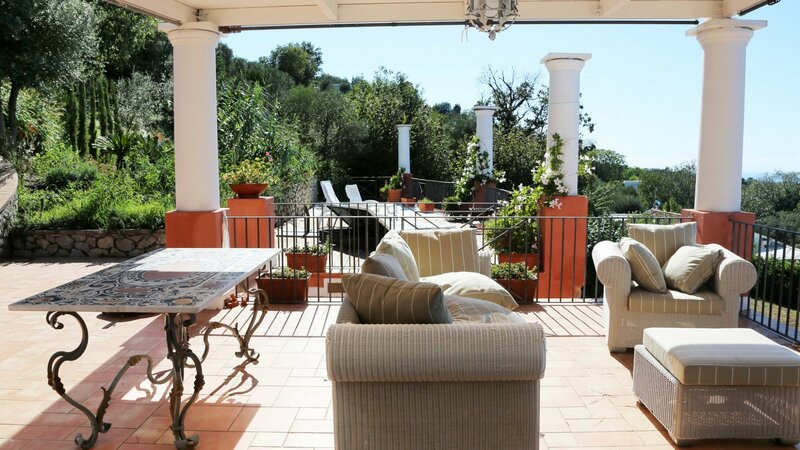 4500 square meters fenced in garden, with beautiful views of the island Ischia and more, covered outdoor lounge area with sea view, sun deck, big terrace with sea view, swimming pool with outdoor shower, covered dining area with table for 8 people. Laundry room. 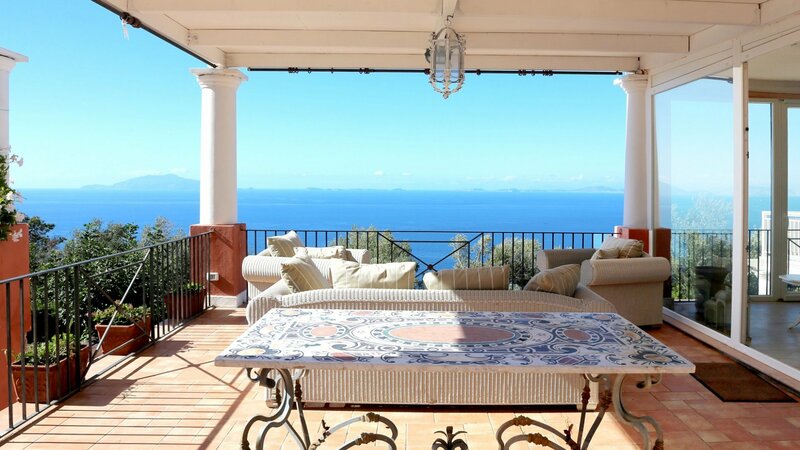 grocery shop 500meters/0,3miles, restaurants 600meters/0,4miles, shops in Anacapri city center 5 minutes by car, nearest beach (pebbles) 2km/1,2miles, bike rental 500meters/0,3miles, tennis court in Anacapri city center 5 minutes by car, . pets allowed upon request, non smoking villa. The key holder lives next door with his family. Driver with small bus (perfect for Capri roads) available on request. From main entrance more or less 25 steps down to the villa. Guest bedroom has a lower standard regarding the other bedrooms. swimming pool 8x5mts, depth; 1,40mts. Concierge service, change of linen on Saturday, change of towels on Saturday and midweek, air conditioning, final cleaning on Saturday. cooking service EUR 30 per hour plus cost of the food, maid service EUR 20 per hour, laundry service EUR 15 per hour, taxi driver at guests' disposal Euro 100-120 per day (if interested, please contact the concierge department). 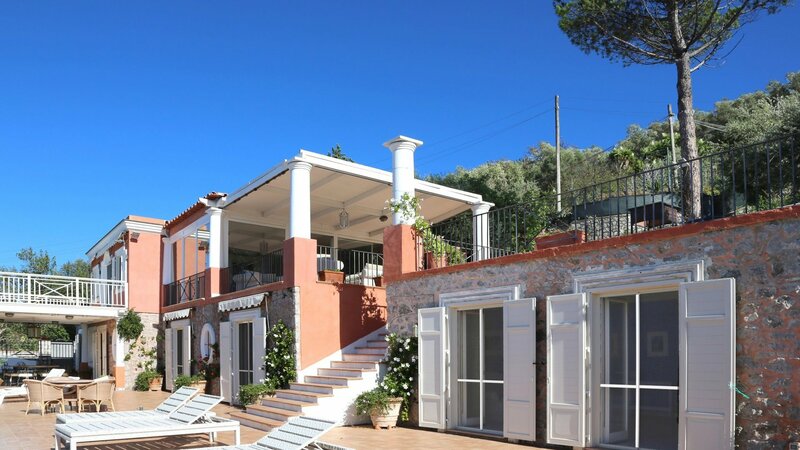 Anacapri main square 15 minutes walking or 5 minutes by car, Capri main square 15 minutes by car, Blu Grotto 16km/10miles by car or 3,7km/2,3miles on foot, Via Krupp 5km/3,1miles by car or 4km/2,5miles on foot. harbor: Marina Grande Capri 6,3km/4miles.